MyMemories Blog: Meet this week's Featured Designer!! This week it's Kathryn Estry! Meet this week's Featured Designer!! This week it's Kathryn Estry! Good morning!! It's Monday, and you know what that means!! It's time for a fun new Featured Designer here on the MyMemories blog! This week it's Kathryn Estry! She's got some great fun and gorgeous Designs in her shop and she has a great giveaway for you too! So, check out her shop and comment below and tell her YOUR favorite Design from her shop! We will be back next Monday with fun news for THREE Lucky Ducks!! Hi! You know I'm a digital scrapbook designer, and that's a big part of me, but I'm also a retired teacher and a wife, mom, and grandma. My husband, by biggest fan, is a sweetie. We live in Fort Worth, Texas, with our little kitty, Amber, and we're really close to our kids and 4 precious grandkids (ages 3 months to 4 years). I dream in Technicolor, don't do sushi, sing in our church choir, enjoy all sorts of board games and math puzzles, and love to dance! Robert and I are members of a choreographed ballroom club, and we have so much fun! When I'm not with the kids, at church, or dancing, I'm probably designing. I so love digital scrapbooking because being a neat freak and a perfectionist, I can make my pages look just the way I like them without messing up any papers or photos or making a mess all over my little studio. I've been designing since 2006, and it ís so much fun that I think I'll be doing this for a long time to come. I LOVE creating in various styles that range from Cute to Gorgeous! 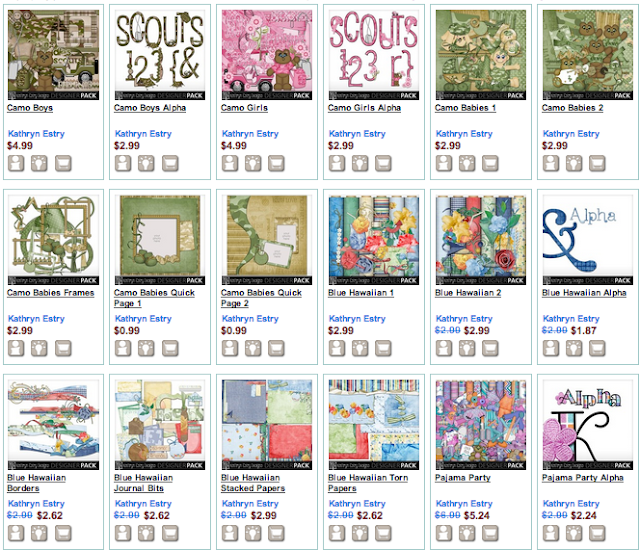 My cutesy kits are loaded with Kathryn's Original Characters, the little people and animals with the big eyelashes. They're fun to use on pages for the kiddos. What I call my Gorgeous kits are just plain pretty and work for all sorts of photos. My wish is to bring designs to you that you love and that will make your photos stand out. Thanks for reading about me, and I hope to get to know you in the forums! So be sure to visit Kathryn's shop this week, and be sure to stay in touch at her FB page and blog as well! Many Designers have great goodies for you on their pages as well! And if you are: KarenS, Dana J, Vanessa, or Caren Doleys YOU are the Lucky Ducks from last week's giveaway, so be sure to send me an email to get the info you need to claim your prize! EMAIL: LisaJ@MyMemories.com! So many fun kits, it's hard to choose a favorite, but I think Kindergarten Kisses is my favorite for back to school time. :) I definitely found several kits to add to my wishlist, though. There are so many beautiful kits to choose from making it hard to decide on just one. I am going to go with the Monica Beach combo pack. Kathryn's designs are wonderful she has something for everyone. Thank you so much, Ladies! I love working with My Memories and getting to know you all! I just posted a Scavenger Hunt in the forums, so check it out! It's hard to choose just one kit as Kathyrn has so many I like but I am going with Lemonade Kisses. Petal Me Pretty is my fav :) Thanks for the chance! I love all of her kits, they are awesome! my fav this month is red, white and adorable! thank you so much for the chance! I'm going to go broke!! I'll go with my top 3. #3 I appreciate American Heroes-Army. My husband is Army and I've been wanting to work on his books. Your design is modern and just what I've been waiting for. #2 Pumpkin Kisses, it's Halloween but BRIGHT, perfect for my young children. But . . .#1 Magnolia Morning is gorgeous!!! I love PURPLE! the shades of purple and violets are beautiful!!! I love the elements too!